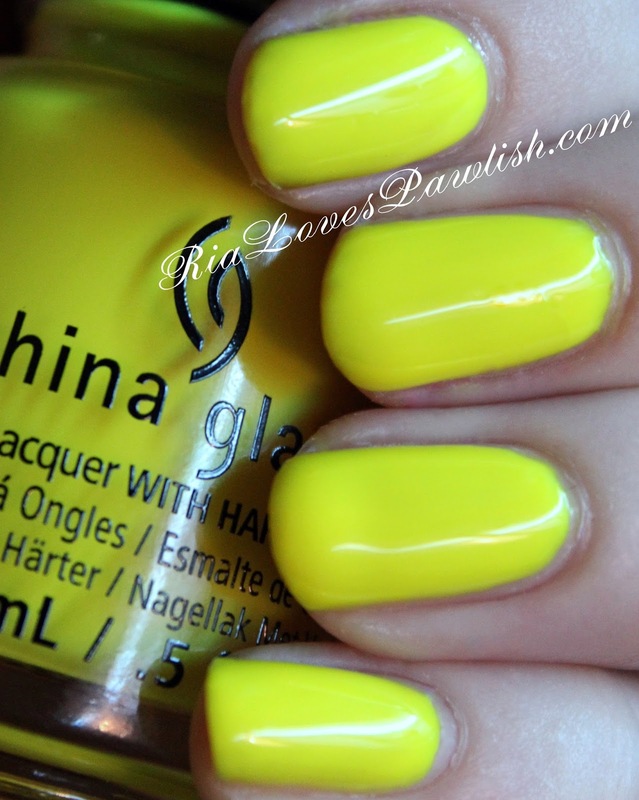 Ria Loves Pawlish: China Glaze Electric Nights... Daisy Know My Name? China Glaze Electric Nights... Daisy Know My Name? Daisy Know My Name? is today's China Glaze Electric Nights polish! (it's a press sample, kindly provided to me for review). it's a bright yellow creme with green undertones... not quite neon, but very bright. this was the only polish that had a fairly sheer formula, i would recommend layering it over white to ease application! i used between three and four coats for full opacity depending on the finger... apparently, i made some coats much more thick than others! this one definitely benefits from a high shine topcoat, it really makes it more rich. three coats DKMN? on pointer and middle fingers, four coats DKMN? on pinkie and ring fingers... then finished off with Salon Perfect Crystal Clear Top Coat. (both products are press samples).